I’ve already endorsed Larry Silcox for Huron County Commissioner. He’s the correct choice. He knows that the Huron County budget must be downsized as the economic picture is projected to get gloomier. His second priority, beyond getting the county’s house in order, is tackling the unemployment problem. He wants to make sure that county residents have opportunities to earn money. While I was out and about Erie County today, guess what I saw? 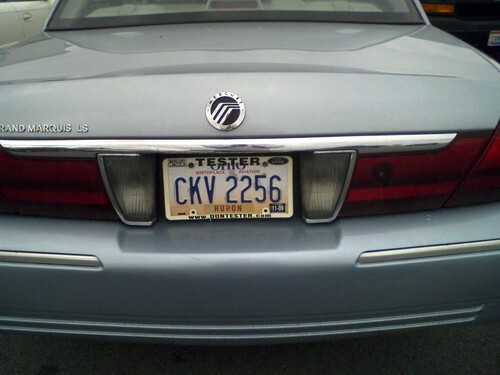 If it’s hard to see the sign on the door of the Mercury Grand Marquis, let me show you a different angle. Granted, it’s not the Sandusky Mall, but this Sam’s Club is located in Erie County, not in Huron County. 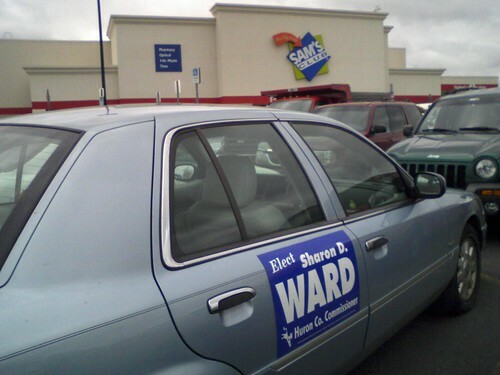 The residents of Erie County, like myself, who see this advertisement on the side of the car, couldn’t cast a ballot for Sharon Ward even if we wanted to, so there’s no point in taking her campaign to the neighboring county. Nope. 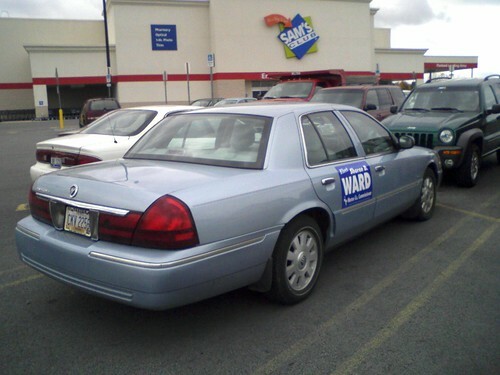 I think this car was parked in the Sam’s Club parking lot for the purpose of shopping. I should point out that while Huron County doesn’t have a Sam’s Club, it does have a Walmart. So how is it that the driver of this car with the Huron County license plates didn’t get the memo that a key plank of the Ward platform is to shop in Huron County, not Erie County? As for residents shopping within the county, it would help if there were more employment opportunities within the county. If people who live in the county also work in the county, then their daily commutes would likely cause them to shop in the county. Silcox is correct to put employment among the top priorities for the county. Ward is putting the cart before the horse, hoping for people to spend without appropriate concern for hoping that people earn. Ward’s emphasis on the spending of Huron County residents shows that she’s out of touch with the economic condition they are in. The emphasis on spending is wishful thinking on Ward’s part that sales tax revenues that the county collects will grow, which suggests she’s not come to grips with the need to tighten the county budget. Again, in light of the failures of Wall Street and the displeasure with which the bailout is being viewed, perhaps Sharon Ward shouldn’t be trying to highlight that her day job is as a financial planner.